I am disappointed that no interior views are shown. That is the functional part of the item. Or did I miss that view? I thought I’d post an update. I have had my large backpack for a good 9 months or so now. It’s gone everywhere with me. At first I carried my 15 inch MacBook Pro in it, and an iPad Air2. I also have some large noise canceling headphones that went in as well. There is a central suspended zipper compartment that holds cables, chargers, etc. The faux leather is holding up well and still looks like new. The wood handme has a big scratch in the one thing to note is that the bag does not expand. I have put a pretty good strain on the latch when overtuffing it. Overall this is a great quality bag. I get lots of comments and it is water resistant. I have been wearing it riding a motorcycle as well. I hope this is helpful, if the drop comes up again. Where can one ask the vendor questions about a prospective purchase, that will be answered? This deficiency is a serious one. Not leather? Not havin' it. I got one of these from the last drop. Admittedly, I’ve only opened the box to admire it and check that there aren’t any defects. So I can’t comment on how it feels in real use. I was expecting it to be leather when I put in the order. I’m OK with it not being leather this time around - I still like the design a lot. But one huge thing I’m concerned about is how this will wear. Leather develops character with wear. Imitation leather, on the other hand, looks great when new, but can often look shoddy and beat up once the surface veneer wears and scuffs off. It can really look bad, like those cheap vinyl purses that look like they should be discarded after the colored surface starts chipping and eroding. Instead of looking stylish and chic, you end up looking cheap. This is a lot of money to pay if its useful lifespan is only as long as the durability of the surface veneer. I probably won’t get one again unless it were real leather. Please, is the flat side wall of the briefcase rigid (albeit padded), i.e., might it serve as a lap desk? If I want to carry a 60% keyboard, which one would be best for it? I really like this design but 2 things.... 1 it's not leather. 2 no pics of inside. For that price I would expect top grain leather. Fake leather or real leather? On rakuten it shows this product as real leather... maybe interpreter is messed up. edit: nvm, they have a real leather version of it too. It's made out of fake leather! Hello CanaryBurgundy! Thanks for your question. They are hooked onto the metal loops you see at the top of each bag. Please see attached images for details. 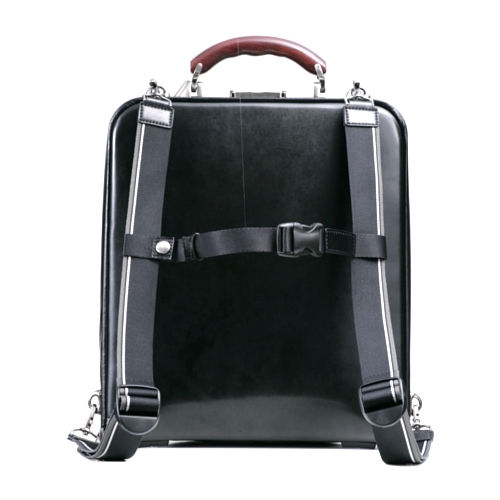 in the large briefcase style, the strap can help the bag act like a messenger. So. got my backpack a couple of days ago. Its nice and so, but cant find the key to the lock. Anyone knows if theres one at all or if its just a design thing? No one knows where to find the key, if it exist? Tomas - ready to buy the black backpack, but it says sold out! Help! Same here... I'm assuming they have limited quantities? Any chance this will be running again anytime soon? Please, is the flat side of the case rigid, albeit padded, or flexible? Would the large brief case hold a 15 inch laptop? It seems that this time around they are offering a "large briefcase" as one of the options. Is there a chance that the "large briefcase" is different from the two others that were mentioned, and can hold a 15" laptop as it's dimensions suggest? The backpack style will hold a 15" Macbook, the Briefcase (the larger one you're referring to) will hold a 13" Macbook, and the smaller Briefcase an iPad. These are the three sizes available right now and their internal capacity. Has anyone received the parcel? Here you can see all three bags along with interior views, etc. Judging by the prices, this Drop is a great deal. Any images of the straps for the backpack? What's the internal organization and compartmentalization like on these? Also, pictures of the internals would be helpful. I had actually found the Artphere website, but wasn't able to view it due to what turned out to be an ultra-restrictive firewall at work. The second link is new to me however. Are the pictures of the backpack actually of the black? Looks different from the color of the briefcases and more similar to the silver on Rakuten. You're correct -- the images on our main page we're using from the vendor feature the grey/silver colorway that we're not currently offering. We'll swap those out soon. You can rest assure that the options images are correct and you can see there the black colorway correctly. Thanks for flagging this! Our vendor has confirmed backpack will hold a 15" Macbook, the Briefcase the 13" Macbook, and the Small Briefcase an iPad. Anyone else get a "classy bowling ball bag" vibe from these? I'm getting an "adult randoseru" vibe. Here's a pic from elsewhere on the web. Thanks Scrapple - our vendor has confirmed backpack will hold a 15" Macbook, the Briefcase the 13" Macbook, and the Small Briefcase an iPad. Could anyone that have this bag let me know if it can fit a 13.3 inch laptop? Hi All - we're reaching out to the manufacturers to get clarity over detailed interior dimensions, but at the moment, this is the info that has been provided. thank you blouie... it seems odd that the interior dimensions of the backpack are square? looking at scrapple's image post it also seems that would make the interior height almost 5 inches less than the exterior? Any chance the manufacturer could just test fit some of the listed laptops? (13 inch and 15 inch MacBook pros)? Thank you! Which bag would be best to fit a 15 inch MacBook Pro, an iPad, cables, external powerpacks, and large noise cancelling headphones? Will the backpack suffice, or is the large brief case bigger? (btw: the specs for large briefcase and briefcase seem to be mixed up?). Thank you! I have a 13" macbook pro, it will be nice to put into description of drop and let us know the if base size or larger will fit, or maybe include some pictures with stuff packed also works.